Improve Customer Satisfaction with BI Platform Monitoring - EV Technologies, Inc. Recently, I bought all-day internet passes to fly to a SAP BusinessObjects Lumira Quick Start engagement (more about that experience later). The internet speed to my destination was lackluster, but I assumed it was limited to that aircraft. Then I connected on my return flight with internet speeds reminiscent of an old AOL dial-up. I expressed my frustration on Twitter and received a response from the airline. In customer service situations, we’re frequently asked if we notified somebody about the problem. But why can’t Delta or GoGo monitor the performance of their own systems? Why can’t Chipotle employees periodically check their dining rooms for dirty tables? Or empty napkin dispensers? And while we’re on the subject, why do frustrated business intelligence users have to call the help desk to report performance issues or outages? Well, they shouldn’t. At EV Technologies, we believe that a comprehensive monitoring solution consists of four components, just like four sturdy legs of a chair. Auditing is built into every SAP BusinessObjects BI4 system but not every customer takes advantage of it. We make sure auditing is configured properly, that it only audits events that add business value, and that auditing doesn’t impact the performance of your BI landscape. Monitoring is built into every SAP BusinessObjects BI4 system but it requires additional configuration to provide value. We make sure monitoring is configured properly and that it notifies BI administrators immediately when the BI system requires attention. SAP Extended Diagnostics is powered by Computer Associates’ Application Performance Monitoring (APM), formerly known as Wily Introscope. The APM engine is integrated into SAP Solution Manager. It can also be deployed independently for organizations who do not use SAP Solution Manager. CA APM provides fine-grained information about resource utilization and is invaluable for validating sizing assumptions and troubleshooting. We install and configure SAP Extended Diagnostics and coach your administrator team how to use it for troubleshooting. 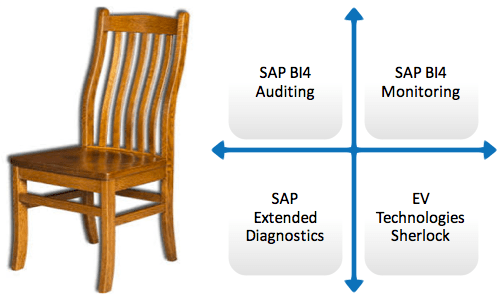 The fourth leg of the chair is our SAP-certified solution, Sherlock®. Sherlock® continuously inspects your system, allowing you to analyze system activity and make fact-based decisions about how to manage your BI landscape. Do your users catch you off-guard with frantic outage calls? We can help reduce system downtime, improve system performance, and increase user satisfaction for your business intelligence system. Want to learn more? Contact us now and ask about our monitoring tune-up service.